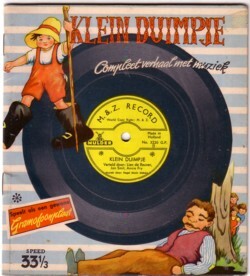 As a kid I didn’t listen to much fairy tale records. My kids don’t like them either, so I have no idea why I still keep so much of them. Or why I bought them in the first place. I have a deep interest in the esoteric meaning of fairy tales, but in the adaptations that are made for records there is usually little left of the original stories. I have done away most of the LP’s, but I kept all the 45’s and other records that i have bought over the years. 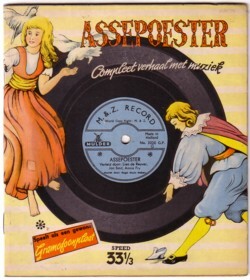 Among my favourites is a series of little books that were also a record, published by the Dutch Mulder & Zoon NV. There is no date on the books/records, but they must be from the early 60’s. I cannot remember having seen them as a child and I have no idea how popular they were. The weird thing is that you cannot read the book or watch the illustrations while listening to the record, because it the same object. And it is pretty dangerous for the record needle to play the thing, because it is not flat. I could only listen to the stories after I used tape to force the books/records into more two dimensional objects than the 3D shape that they naturally have. The sound quality is poor; even my trained ears have a hard time filtering out enough of the surface noise to enjoy the story. Hard to imagine that little children in the 60’s were willing to do so much effort. I guess that Mulder & Zoon produced these collectors items for the future, for people like you and me. I don’t have the complete series. There are at least ten different titles, and I have only six. And two are in the mutilated form, in which many of these paper records have survived their time-trip. But I should not complain, there are days when I hardly think of it. Here is how the records sound, in case you are interested. Hi there…........took me ages to find something on Mulder & Zoon. I have Cinderella in the series. Not in bad shape considering the age ( or possible age as there is no dates)......I did have a chuckle about the fact you cannot look at the pictures whilst the record is playing…:) I dont know if the record works, I have had this little book for about 15yrs. As we are soon to live on a boat I would dearly love to find it a good home. Let me know if our interested. 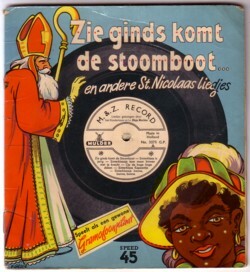 The plastic film IS the record! I am still looking for info on how this was actually done and who invented it. Hi all, funny…looking around for Mulder en Zoon. My grandfather was the Mulder that owned Mulder en Zoon and I vagely remember visiting the factory in the late 60’s . @Rick: Isn’t there an archive somwhere? I would love to have a book about your family’s company! Rick’s question is a very valid one. For such a prolific firm there is very little documentation around. I only have the 1951/52 catalog, are there more around? I was like 8 years old at the time. I recall my G Dad died around 1973, my Dad and Uncle sold the factory and we moved to Portugal in 1975. 2 years later we moved to the USA. I will ask my older brother if he has info or docs, but I doubt it. SOMEWHERE, we have pics where the Dutch Prince (forget the name) visited the factory. I’ll see if I can find them and post them somewhere. I have the English version of “Snow White” Its still in very good condition. I’m trying transfer it to CD here in Melbourne. My brother & sister & I enjoyed this recording so much. It must be at least 50 years old. I would love to know more about the Mulder & Zoon Company history. Russell Cox, Melbourne, Australia. I have “The Little Mermaid’ with a record on the front. Any idea of value? I have one King Frog-speed 33 1/3 in good condition.Would like to know more,and whats the value. I have a Mulder and Zoon “Cowboy and Red Indians” board game in excellent shape. 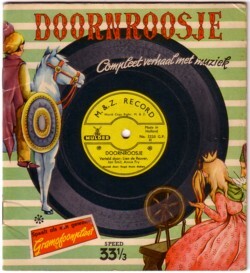 The front of the box is brightly colored and shows a cowboy on a bucking bronco, Indian, game pieces inc. horse cards. The actual name of the game is not on the box, only on the inside of the lid where the instructions are ( in 4 languages). The only writing on the box is on the lid edges, very small, and say Mulder & Zoon N.Y. Amsterdam. I can’t find any info on this game at all. I have Cinderella and red ridding hood. I’m trying to find out there value and when they were 1st published. Hello from Canada! I just purchased 2 of the M & Z storybooks – Puss in Boots & Red Riding Hood (in English) for 75 cents each!! 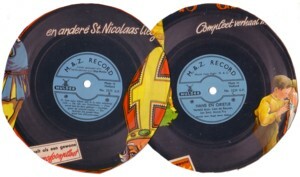 They do not contain records and I think they are much older than the ones shown. Judging by the exquisite colour illustrations by J.C. van Hunnik and text by Ann Lewis, these books may be from the 1930’s or 1940’s. I would love to know if anyone has any info on these new-found treasures. There only identifying mark on the books are these title numbers?? Puss in Boots = No. 1535 D & Red Riding Hood = No. 1535 A. There is a list noted on the back covers that states there are 6 books in this series: Little Tom Thumb, Little Red Riding Hood, Snowwhite, Puss in Boots, Cinderella and Sleeping Beauty. Note: My book’s title is Red Riding Hood, but is listed in the series on the rear cover as Little Red Riding Hood. Odd, no? I have “ Circus Fun” no record or information. Got it at a garage sale. No age on book. I have the circus fun book it belongs to my husband from his childhood as he is from Holland but there is no writing on the book mulder and Zoon no 48 B are they antique or not? I have the complete series of all eight books.